Designed for effective plaque removal on tooth surfaces and below the gum line. For effective plaque removal on tooth surfaces and below gumline. 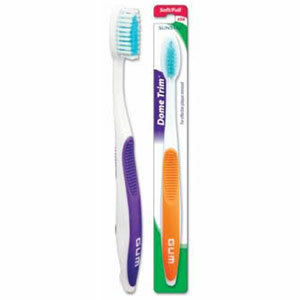 Dome Trim® bristle design clinically proven to fight gingivitis. Raised center bristles form a domed cleaning surface. Clinically proven to reduce plaque below the gumline. Textured bristle tips effectively picks up the plaque. Comfortable soft grip with raised ribs on both sides.